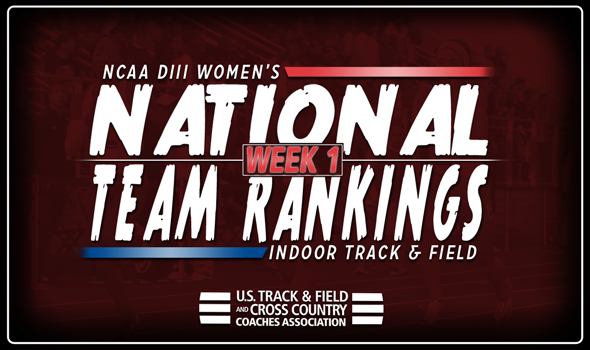 NEW ORLEANS – Big jumps highlighted the NCAA Division III Women’s Indoor Track & Field National Team Computer Rankings in Week 1. There were six teams that climbed six or more spots from the preseason, headlined by Johns Hopkins. The Blue Jays went from No. 9 to No. 3, their best ranking in program history. Oberlin and MIT remained No. 1 and No. 2, respectively for the second week in a row. Johns Hopkins follows at No. 3, with Williams and Ithaca at No. 4 and No. 5. The biggest reason for the Blue Jays’ flight was their distance medley relay team this past weekend. Johns Hopkins’ quartet got the baton around the track in 11:56.67, which sits No. 1 on the NCAA DIII Descending Order List and No. 1 in the USTFCCCA Rankings. The Ephs are ranked in the top-5 again, which is a familiar place for them. Williams has been ranked in the top-5 nine times in the past two years. Outside of the outstanding high-jump duo of Emma Egan and Helene Hall, the Ephs can count on their solid 4×400 relay (ranked eighth in the nation at the moment). Emory cracked the top-10 for the first time since 2014. The Eagles were one of the biggest gainers of the week, flying 24 spots. Emory has a 4×400 and distance medley relay that are both ranked in the top-6 nationally. Defending champion Washington (Mo.) went from outside the top-25 to No. 12 this week. The Bears’ 4×400 relay is ranked No. 3 in the nation according to the USTFCCCA Rankings and Alison Lindsay is always a threat in the distance events. Wartburg jumped 15 spots from No. 31 to No. 16. The Knights galloped to the front of the rankings in the 4×400 with their effort of 3:56.20 this past weekend. This is the second time in the past three years that Wartburg has been ranked in the top-20. Bates had the most substantial improvement of the week as it went from No. 45 to No. 18. The Bobcats already had the top-ranked triple jumper in the nation in Sally Ceesay, but can add the third-ranked distance medley relay team to the mix as well. You’ll want to check back throughout the season on these rankings as they’re bound to change before the NCAA Division III Indoor Track & Field Championships, which will be held March 9-10 in Birmingham, Alabama.